Blades can be dangerous and you can easily cut yourself without proper care. In order to make the multi-tool army Swiss knife safer to handle, RAVPower has included an ingenious safeguard that prevents the blade from accidentally closing on your fingers by requiring you to push inwards to fold it. Whether you need to get things done at home, or you’ve gone camping, fishing, or hiking and you’re hesitant about the idea of packing the whole toolbox, RAVPower has you covered. 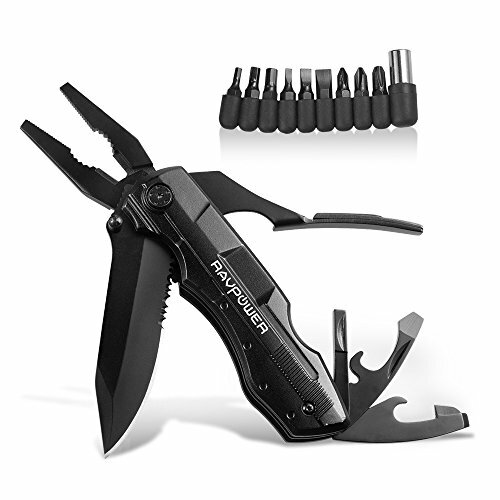 The multi-tool army knife seamlessly transforms into a plier, can opener, knife / saw blade, bottle opener, and even a screwdriver with the included 9-in-1 bit set. Tools work great until they don’t anymore. This being caused by a series of circumstances including the formation of rust. The tools sealed within the RAVPower multi-purpose kit are different. Made of black oxide stainless steel, these will serve you impeccably over the years without rusting. No matter whether you rely on your right or left hand to grab and handle, the Swiss army knife hosts its innumerable tools within an ergonomic handle that’s symmetrically flat on both sides to suit both righties and lefties. Included is a sturdy belt clip pouch to store the blade and sail for adventure.